When a freelance photographer snapped a small family arriving in Europe from war-torn Syria, his picture said more than words ever could. 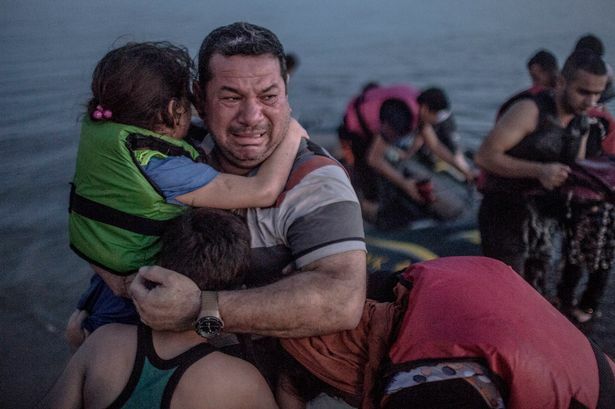 An image which perfectly captures all of the stress, fear and hope of the migrants arriving in Europe who have hit the headlines this summer.The tears of joy streaming down the face of the Syrian dad are even more heartwrenching in the context of him clutching his son and daughter close. Freelance photographer Daniel Etter snapped the image showing the Syrian refugeefrom Deir Ezzor, holding his children, and breaking out in tears of joy as they arrived on Saturday on the Greek Island of Kos.The small family were arriving via a flimsy inflatable boat crammed with about 15 men, women and children, all hoping against hope that their lives would get better – and their luck would see them through a dangerous and terrifying journey. The UN reveals that last week alone 20,843 people arrived by sea in Greece – 82% from Syria, 14% from Afghanistan and 3% from Iraq.